Recorded live in Zurich, this album features stellar performances from Vinnie Colaiuta, Paul Jackson Jr, Tom Brooks and the man himself, Abe Laboriel. It features a stack of favourites such as 'Give Your Love', plus some roaring new tracks. 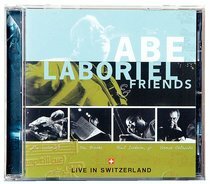 Music Manager's View Christmas Sale 2006: Having only recently heard this album for the first time, I was blown away by the talent of Abraham Laboriel. Abraham is a world class musician who has performed with many renowned artists throughout his career. This is a great value-priced jazz CD, which would be perfect as a gift for Christmas or for your own enjoyment. If You Like: James Morrison.